According to Microsoft's virtual assistant and Siri-competitor Cortana, football clubs in red will have a great time at this weekend's Barclays Premier League derbies.Using the Bing Predicts feature, Cortana is giving Liverpool a 12.5% edge over Everton in their match, while Arsenal have a 13.1% greater chance of winning the North London derby than rivals Tottenham. Bing Predicts combines data from a number sources including social media comments, search trends and historical data. In the past, it has correctly predict the outcome of the World Cup and the Scottish referendum, so if your team is Everton or Tottenham you might want to brace yourself for disappointment. 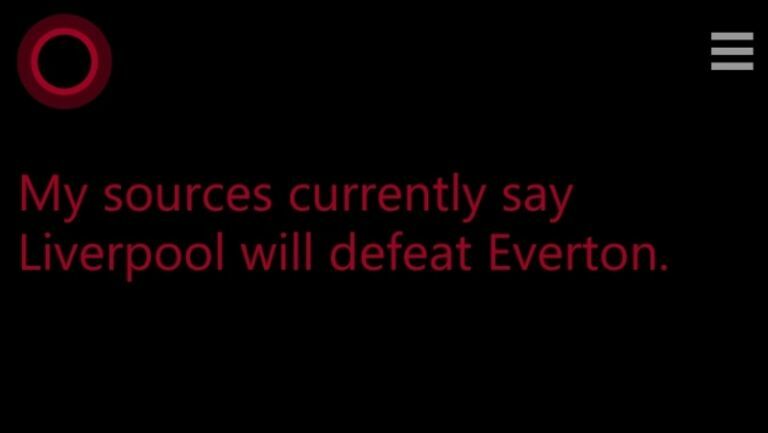 Cortana recognises speech commands and if you have it installed on your Windows Phone you can ask various questions such as “Predict Liverpool match” or "Will Arsenal beat Tottenham?" Who needs to go down the pub with your mates when you can just bark requests at your smartphone instead? To find out more, ask Cortana for “Premier League Predictions”, or if you don't have a Windows Phone, you can type in the phrase at www.bing.com. Just don't ask who will win between Cortana and Siri. Not only did it successfully call whether or not Scotland would become independent, Bing Predicts also notched up an impressive 15 correct predictions (out of 16) regarding knockout rounds in the 2014 World Cup. Using a similar data model as the Bing search engine, Bing Predicts uses statistics to estimate the historical strength of teams by comparing wins and losses, margin of victory, location of matches, weather conditions and more. It then incorporates web activity and social data to refine the models. This means if there's a lot of chatter amongst fans about the strengths (or weaknesses) of a team, this “wisdom of the crowds” is also included.Each team in every Premier League match will then be given a percentage that relates to their statistical probability to win the match. Bing has been predicting US sports for a while now, but it will be interesting to see how accurate its foray into British sports will be.